Originally starting in only 48 square feet of space, in 1993, Pickles has grown up, and is a favorite of the locals & tourists for lunch or dinner. When it first opened the menu consisted of hotdogs, draft beer and, of course, pickles. 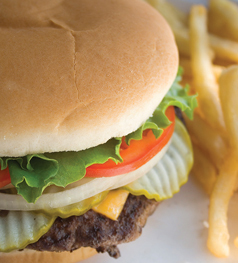 Today the all-American burger grill by the beach is known for its Paradise Burger, chili cheese dogs, fried grouper sandwiches and of course it’s Famous Fried Pickles. The walk-up grill, know as “the world famous pickles” is located right on Seaside, Florida’s Central Square, just steps from the shore. It faces 30A, the amphitheatre and all the hustle and bustle of downtown. Sitting under the shade of the magnolia trees with a soft Gulf breeze makes for some of the best people watching in town. In the summer time, when the heat is on, the Pickle’s Mister System activates and a gentle wave of mist fills the entire dining area, creating a cool environment and a subtle air of excitement. Don’t forget the children – they love Pickles. Whether it’s a hotdog, corndog or funnel cake they’re after, the kids will have a blast here. Hours: Opens at 9 a.m., 7 days a week.